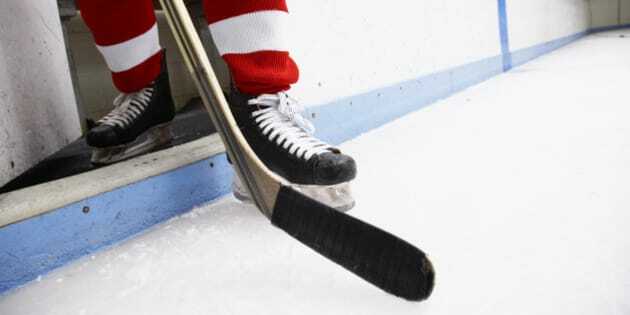 Police are investigating a hockey violence incident after one child allegedly hit another child repeatedly over the head with a hockey stick at the Burnaby Winter Club. Sources have told CBC News that one child hit the other as he was untying his skates and the injury drew a lot of blood, sending the victim to the hospital. The traumatizing fight happened post-practice of the pee wee hockey team of the Burnaby Winter Club — the same club of which one hockey dad pleaded guilty on Thursday to uttering threats to a nine-year-old teammate of his son. Burnaby, B.C. RCMP Staff Sgt. Major John Buis said police are in the early hours of the hitting investigation. "We&apos;re still investigating. We have a police officer going to see the parent, but the allegation is one person hit another person over the head with a hockey stick." CBC has been unable to reach the family for an update on victim&apos;s condition. The club is also conducting its own investigation and checking if its own policy of having two adults in a dressing room at all times was followed. "The board of directors of the Winter Club has a zero tolerance policy. There is a code of conduct for members," said Len McNeely, general manager of the Burnaby Winter Club. While the club&apos;s investigation is underway, neither of the players involved in the alleged attack will be playing hockey with the team. Guido Lamberti-Charles, the team coach, has also coached in Europe where he says such incidents are rare. He said there is huge pressure behind the hockey movement in Canada, and when some kids play with teammates who are not as serious as them about the sport, that can lead to bullying and tension. "I think parents personally put too much pressure on the kids. They don&apos;t let the kids coming out of practice enjoy hockey," he said.